Ez 37:12-14 I will put my spirit in you, have you rise from your graves, return, live, and know I am the Lord. Ps 130:1-8 "With the Lord there is mercy and fullness of redemption." Out of the depths I cry to you; hear me! I trust in you; you'll redeem us. Rom 8:8-11 Those in the flesh can't please God, but you're in the spirit if the Spirit is in you. If Christ is in you, the spirit is alive, and if the Spirit dwells in you, the one who raised Christ will give you life. Jn 11:1-45 Lazarus was ill in his sisters Mary and Martha's village. The sisters sent word to Jesus. 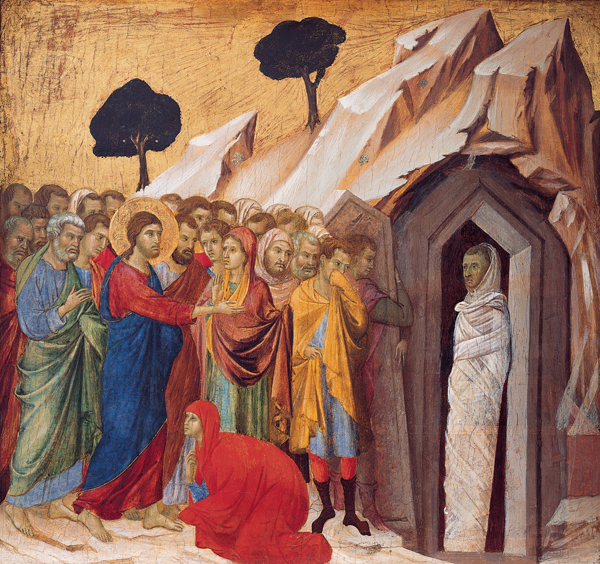 Jesus: “It won't end in death; it's for God's glory.” When he arrived, Lazarus had been dead over four days. Martha / Jesus: “If you'd been here, he wouldn't have died.” / “He'll rise.” / “Yes, in the resurrection.” / “I am the resurrection; whoever believes in me will live.” / “I believe you're the Christ.” She called Mary who went to him: “If you'd been here, he wouldn't have died.” / “Where have you laid him?” / “Come.” Jesus wept. / “Take away the stone.” / “There will be a stench.” / “You'll see God' glory.” They took it away. Jesus: “...Lazarus, come out!” He came out, tied and wrapped. “Untie him; let him go.” Many believed. Angelus: The life of one who believes in and follows Jesus will be transformed. He waits for us, and the Spirit's strength will raise those united to him. We're marked by death; Jesus' ‘Come out!’ cry is for us too, from the Master of life who's not resigned to the sepulchres we've constructed with our sins. He invites us to come out from the tombs into which our sins have plunged us, our prison of contentment with a false, selfish, mediocre life. It's an invitation to freedom from the pride that enslaves us. Our resurrection begins when we decide to obey Jesus, when our masks fall and we rediscover ourselves in the image of God. There is no other limit to God's mercy offered to all! The Lord is ready to take away the tombstone of our sins, which separate us from Him, the light of the living. [On giving out pocket books of the Gospels with Acts:] “Without cost you've received; without cost give” the Gospel message! Perform an act of charity, a gesture of love, a prayer for an enemy, a reconciliation.... You can also read the Gospel on a phone or tablet. Jesus speaks in the Word of God; read and welcome it, and bear fruit! Passionist: In failure we can discover the power of the resurrection. 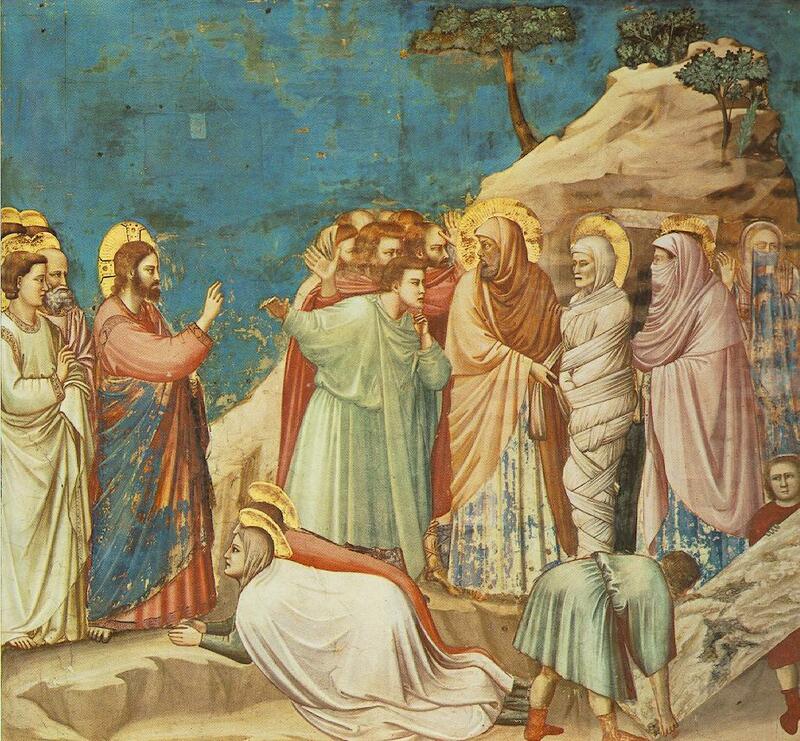 As Jesus wept, felt his loved ones' pain, and raised Lazarus, he still feels and raises up.